This is a gallery of Teresa’s artwork that has sold to collectors all around the world and are now part of private art collections. Artist Comments: Fishing is a popular recreation for those lucky enough to find the time to fish for the “big one.” I don’t particularly like to fish myself, but I have several friends who do enjoy this sport. I found this particular marine life painting an interesting subject to paint. Note: This painting sold to a private art collector in Virginia. Artist Comments: This rustic oil painting is another example of a non-traditional still life. 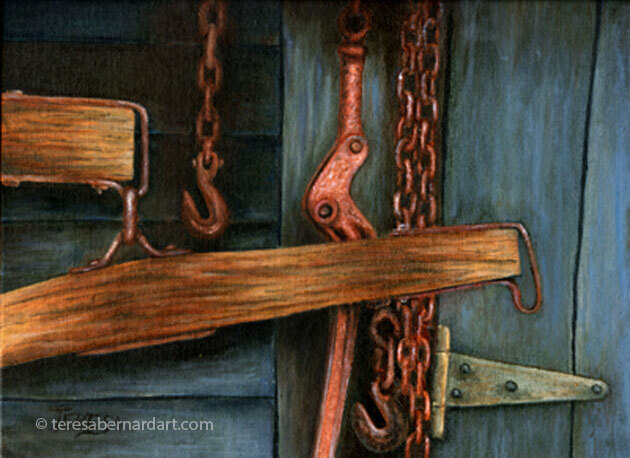 It is a composition utilizing horse tack hanging on an old barn door. A still life doesn’t always have to be a traditional type using flowers, fruit or figurines, it can be composed of any inanimate object. Note: This painting sold to a private art collector in Illinois. 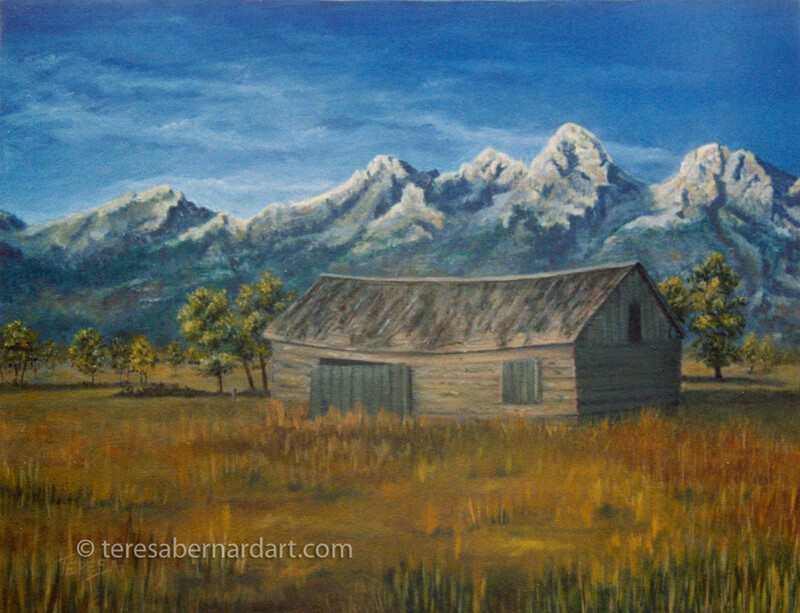 Artist Comments: The Grand Teton Mountains is one of the most beautiful mountain ranges in the U.S. Located in northwestern Wyoming, this mountain range is the central feature of Grand Teton National Park. Several years ago I had opportunity to visit this park and was awed by the stunning mountain scenery. For more information visit the Grand Teton National Park website. Note: This painting sold to a private art collector in Georgia. Artist Comments: This winter landscape is one of my favorite snow paintings. I really enjoyed painting this fence post with all its knots, texture, and that hole. Painting those shadows in the snow turned out to be quite interesting too. 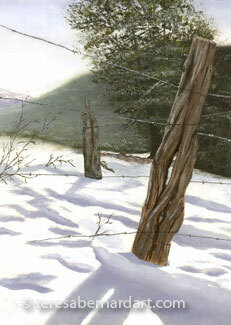 I thought the barb wire was going to be a bit of a challenge to paint and almost left it out. Note: This painting sold to a private art collector in Massachusetts. Artist Comments: The photo that inspired this sunset painting was borrowed from my brother-in-law who photographed this scenery. It was taken near Austin where he lives with his wife. Texas is known for having some of the loveliest sunsets in America. As a native of Texas, I can attest to that myself. 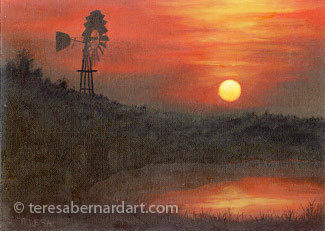 This painting is part of the Life In Texas Series. 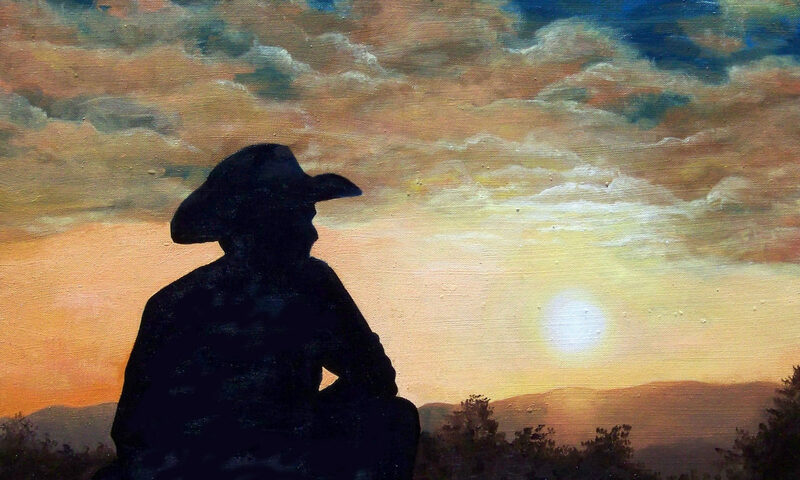 Note: This painting sold to a private art collector in Texas. Artist Comments: This is a portrait painting of my daughter Tera. I painted it using her high school senior portrait as a reference photo. However the background in the painting is an entirely different setting than what was used in the photo. 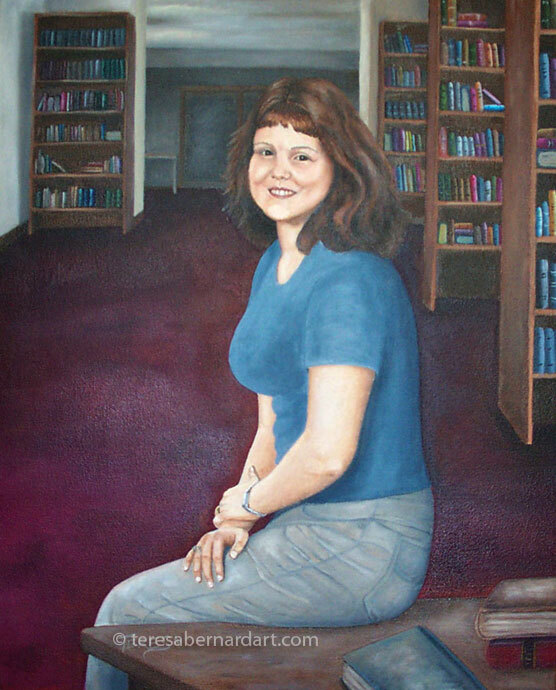 At the time I did her painting Tera was attending college studying to become a librarian so I chose a library setting for the background instead. All through high school Tera had wanted to become a librarian and even worked after school and weekends at a local branch of the public library. She loved books and reading and still does to this day. The background in her painting is of a fictional place and is not the library she was working at during high school. This was a fun painting to do and I took my time with it as I wanted everything to be just right. First of all, the subject matter is near and very dear to my heart. Secondly it was both fun and challenging to paint all those books on the shelves. I captured a very good likeness of Tera with this painting, however when I photographed it for my website, I realize my photography skills need some improvement. Portrait of Tera is part of my private art collection and is not for sale. Someday it will be passed down to Tera as a family heirloom, but for now it continues to hang on the wall in my living room. 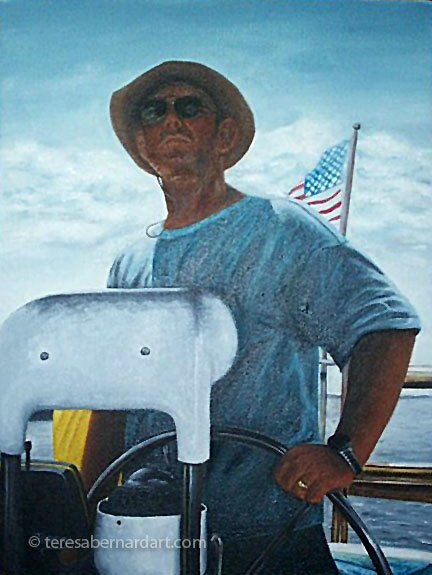 Artist Comments: This painting is a portrait of my husband Robert at the helm of our sailboat Misty Blue. I did this painting from a photo I took during a trip we made on the boat going up the Innercoastal Waterway. On this particular trip Robert, who was in the Navy at the time, was being transferred from Jacksonville FL to the naval base in Norfolk VA. We had to figure out a way to move our 36 ft. sailboat from a marina near where we lived in FL to VA so we decided to sail it instead of having it shipped. (That decision saved us a ton of money and made us rich with memories!) At first we were sailing out in open waters up the east coast, but a storm suddenly came up forcing us to go inland and up the ICW instead. It was a bit frightening for me when we encountered that storm because it was my first sailing trip, however Robert handled it and the sails like the sailing pro he is! Robert was on deployment with his ship at sea for six months when I started his portrait. I finished it before his return. He had no idea was I doing this painting and was very surprised to see his portrait when he returned home. This painting is part of my private art collection and is not for sale. One day it will be passed down to his son Travis has a family heirloom, but until that day it will continue to hang in our living room. Artist Comments: This painting is the second of two commissions I did for an art collector. This particular art collector saw a previous painting I had done called “Peggy’s Cove” and contracted me to do two paintings of the same subject for her. Peggy’s Cove, Nova Scotia is a favorite place that holds many memories for her. 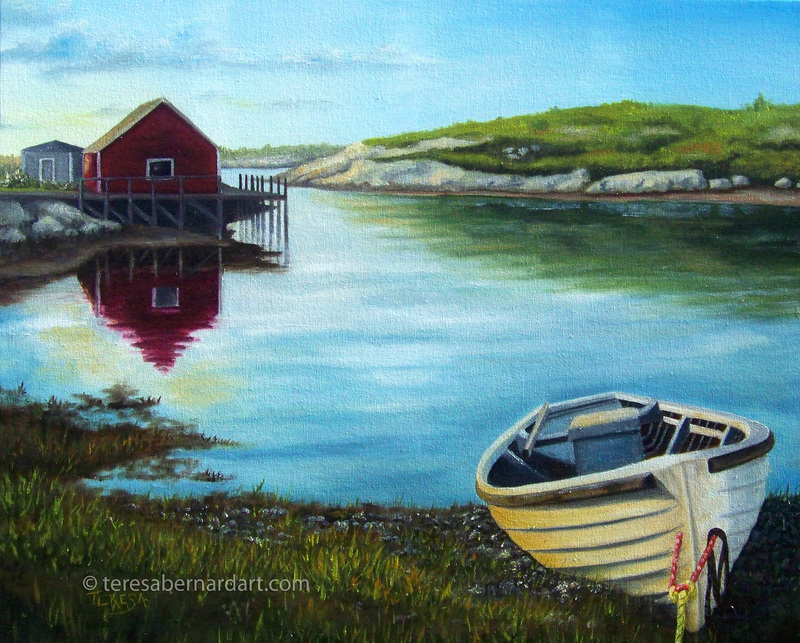 The other painting is called “Peggy’s Cove Revisited.” This painting is part of the Peggy’s Cove Series. Note: This painting sold to a private art collector in Mississippi. For more information on how to commission a painting select Art Commissions Info. Artist Comments: “Peggy’s Cove Revisited” is one of two commissioned paintings. An art collector contacted me after seeing a previous painting I had done called “Peggy’s Cove.” Although this painting is the same subject as the first one, there are some noticeable differences between the two, making Peggy’s Cove Revisited an original oil painting and not a reproduction. 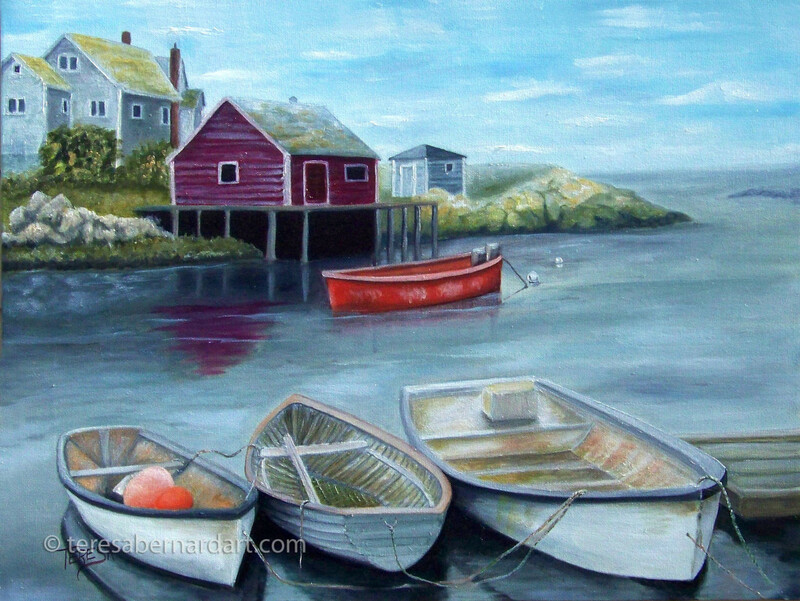 Peggy’s Cove, Nova Scotia is a favorite place that holds many memories for this art collector. She commissioned me to do two paintings for her. 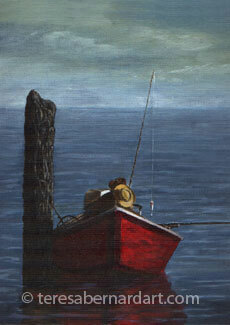 The second painting is titled “Return To Peggy’s Cove.” This painting is part of the Peggy’s Cove Series. 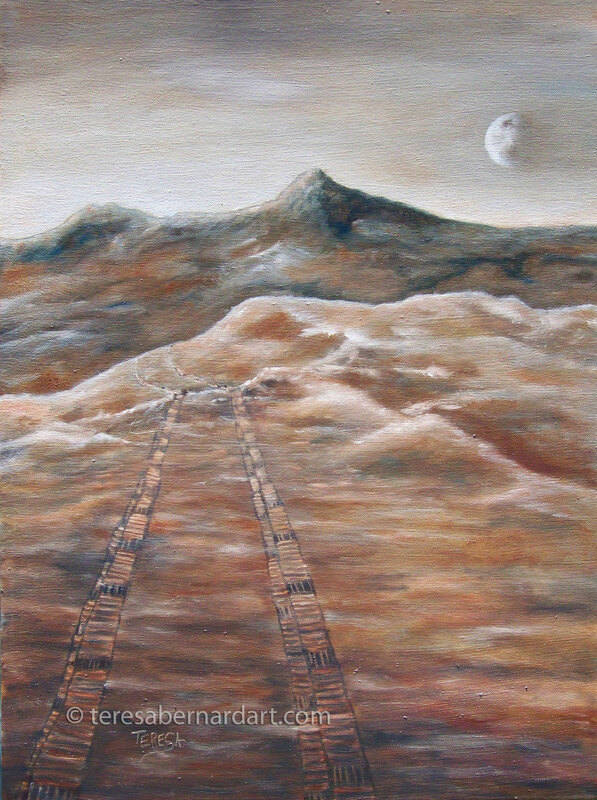 Description: Tracks left behind by one of the land rovers on the surface of Mars and one of its two small moons visible in the sky. This painting did not require a frame as the image extended around the edges of the painting. My client did not want the actual land rover in his painting, he just wanted the tracks that were left behind on the “red planet” by the robot vehicles. I had to do some research on this subject before I could actually compose this painting. So I looked at many NASA photographs of Mars and the two now famous land rovers before starting this painting. I had to get a feel of what the landscape is like as well as study the wheels of the land rovers so I could understand how their tracks were made when they moved across the dusty landscape. My client was very pleased when he saw his painting for the first time. NASA’s Mars Exploration Rover Mission (MER) is an ongoing robotic space mission that began in 2003 with they sent two land rovers to explore the Martian surface and geology. Read more about NASA’s Mars land rover expeditions.  For more information on how to commission a painting select Art Commissions.